Drew and his men got ready offsite and the suit he selected was honestly one of the coolest ones I have sever seen. He wore it well! The Glass Box is always the perfect setting for brides and their ladies to get ready because of that lighting and even though Amanda had 10 bridesmaids there was plenty of space for them to spread out. We love the mixed dresses she choose for each of her girls, the color palette was amazing. And what about her blush gown!! Amanda’s father passed away when she was young so they added his wedding ring and his picture to her bouquet, what a sweet way to have him with her that day. Even though the weather was not cooperating they chose to do their first look outside and with umbrella and rain boots in hand they took to Fayetteville Street and had a blast with their bridal party. And in true artist fashion Amanda was sporting her designer jean jacket. Once inside they all headed back to the Glass Box to wait for the ceremony to begin and the rooftop made for a fun rainy day picture. 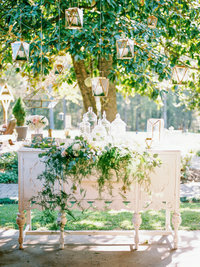 They exchanged vows and rings in front of a romantic backdrop we created with blush draping, a copper arch, geometric lanterns and flowers to die for. Amanda’s mother met her at the aisle and walked her the rest of the way down where her uncle officiated for them. Afterwards, they stopped at the end of the aisle to get a group photo with all their guests. When the ceremony was over we flipped the space for reception while guests headed to the landing area to mingle and enjoy appetizers and cocktails. A copper wall displayed their assigned tables and copper rings with greenery and flowers were hung in the hallway for a bit of whimsy. 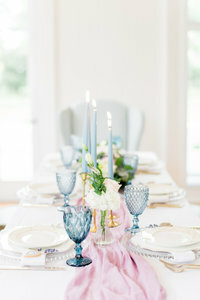 We placed farm tables with cheesecloth runners in front of the windows for the bridal party and it was elegantly set with copper chargers, geometric vases, and dusty blue napkins, water glasses and napkins for a pop of color. Acrylic name cards in copper pipes finished the look. 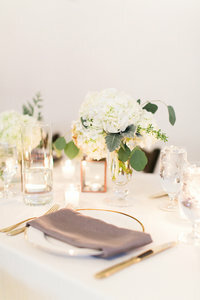 Guests were seated at round tables with a mixture of gold geometric vases, candles and rose gold silverware with linens and napkins in neutral colors. Amanda’s artwork was used as table numbers so guests could see just how talented she truly was. A lounge area was created for guests in shades of blue and their love for San Francisco was displayed on the chalkboard wall using the Golden Gate Bridge. After their first dance and Drew’s dance with his mother guests were treated to a wonderful dinner followed by heartfelt toasts by the best man, Amanda’s sister/maid of honor and her mother Sharon. And because Amanda’s father could not be with her that day her mother had a life size stand up of him created and there was not a dry eye in the room, it was so heartfelt and beautiful. 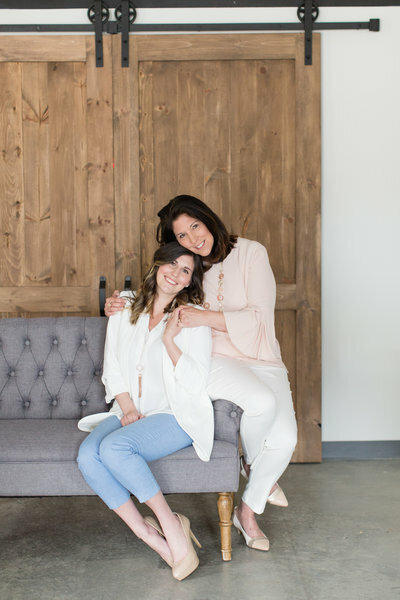 Before dancing kicked off, Drew and Amanda played the shoe game to see how much they truly knew about one another and Amanda joined her sister and mother for a sweet serenade to a song that was sentimental to the three of them. Once dancing started the floor stay packed for the rest of the night and although the rain never let up and guests could not send them off with a true sparkler exit, they did manage to head outside to get a few photos with just the two of them and it was so worth it. What a gorgeous wedding, wonderful people and a bride and groom I truly adore. And it could not have been possible without a team of vendors by my side making their dream wedding come true so here’s a shout out to everyone who made it happen. Much love to you all! 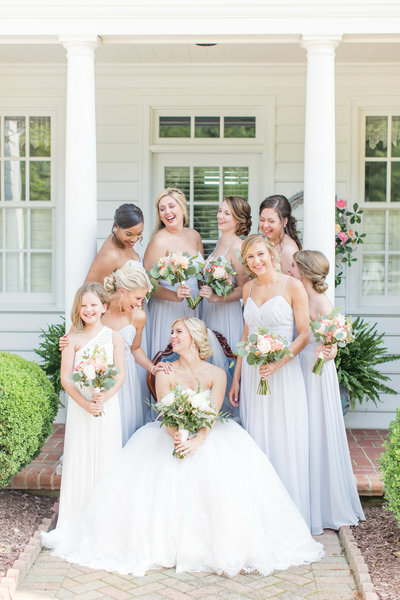 **To see another downtown Raleigh wedding at The Stockroom, click here!